What would be like to find a genie's lamp and get three wishes that could change your life forever? Find out when you spin the reels of the new Genies Touch slot machine from Quickspin Gaming! 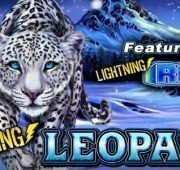 This game has 5-reels and 20-paylines coupled with a bounty of features that will keep your wishes coming true for hours on end. What would be like to find a genie’s lamp and get three wishes that could change your life forever? Find out when you spin the reels of the new Genies Touch slot machine from Quickspin Gaming! 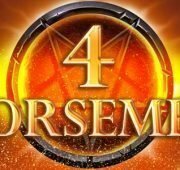 This game has 5-reels and 20-paylines coupled with a bounty of features that will keep your wishes coming true for hours on end. One thing you might notice as soon as you start playing are the high quality disney-esque graphics on screen. The phenomenal display is characteristic of Quickspin slots so if you like this one, you might want to check out all of their other games. You’ll be inside an ornate palace spinning the reels which are decorated with a variety of colorful jeweled symbols, as well as characters like an Aladdin, Princess Jasmine, Sultan, Jafar and special symbols like a wild, magic lamps and bonus scatter symbol. 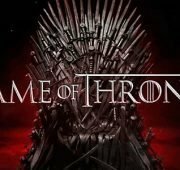 Read on to find out about the valuable features of this game. Golden Wilds – The Wild emblem is a golden symbol that substitutes for all symbols except the bonus scatter symbol to complete winning combinations when possible. 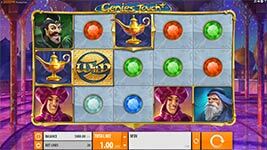 Magic Lamps & Genie’s Touch Feature – Landing in both the base game and free spins, you’ll need to land three or more Magic Lamps symbols to trigger the Genies Touch feature. During the Genie’s Touch Feature, Magic Lamps activate and an adjacent symbol is randomly selected. One of the selected symbols will be used to replace all other selected symbols, including the Magic Lamp symbols. The game will always choose the symbol that creates the best possible win combinations. 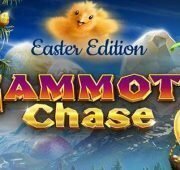 Free Spins Bonus Scatter – Three bonus scatter symbols on a single spin will initiate 10 free spins! During Free Spins, extra Magic Lamps are added to the reels giving you opportunity for bigger wins.